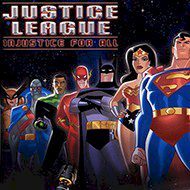 There is nothing impossible for the member of the Justice League. This time Superman and Wonder Woman should deal with the invasion of evil robots. Use your special abilities and stop them! Sometimes even Superheroes experience difficulties dealing with dangerous enemies and their minions. The invasion of evil robots is being controlled by the evil ruler, whose name is still unknown. Superman should kill the hordes of the robots in order to get closer in this investigation. Can you help him to stop this madness?